One of the great side effects of moving to renewable power is that we will replace vulnerable, brittle centralized systems that are too big to fail with spread out democratic energy sources small enough to be resilient. Community Power makes a compelling case for moving in this direction. Community Power is a must read for anyone interested in the myriad of benefits (jobs, lower prices, energy security, sustainability, economic development) that can be derived from local decentralized electricity generation. Decentralized power is truly “POWER TO THE PEOPLE.” This publication provides a clear explanation of how and why our communities have so much to gain from local decentralized power and so much to lose if big energy corporations continue to control our energy resources. Distributed generation offers a unique set of economic, social, and environmental benefits, including the ability to diversify energy markets, turn buildings into profitable power plants for even low-income households, and to spur a wave of small-business job creation. Community Power provides an essential guide to the technologies, policies, and management skills needed to make this energy transformation a reality. 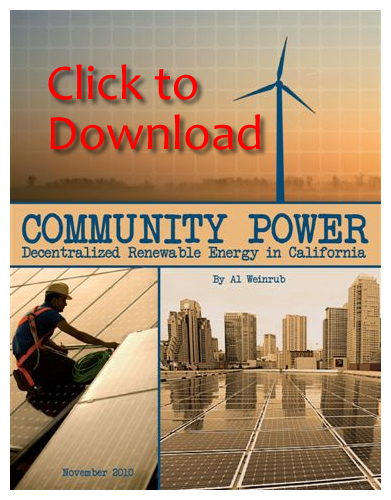 Al Weinrub’s Community Power puts forth practical and achievable renewable energy solutions for communities most impacted by our dependence on fossil fuel. Community Power exemplifies how distributed/decentralized generation creates genuine local green jobs and environmental health benefits for communities across California choking from dirty air and toxic dumping. Anyone who prefers community control over profit-focused utilities, and anyone who wants clean air for our children should read Community Power. The renewable revolution has begun and Californians are finally waking up to the role community power can play in our energy future. Al Weinrub’s Community Power is leading the charge of electricity rebels calling for distributed, decentralized renewable generation in the Golden State. Al Weinrub's groundbreaking work on decentralized renewable energy in California has lessons that apply around the world. Community Power is about the political economy of energy--who benefits from different models of power development--and provides an analysis that has relevance everywhere. Hans Joseph Fell, Member of the German Parliament; Spokesperson for the German Green Party; Founder of The Energy Watch Group. Community Power shows that local renewable power generation can open doors to clean energy careers for working class communities of color. It can bring jobs, health, and wealth to cities like Oakland. California must take a multi-faceted approach to meeting its future energy needs and this includes decentralized renewable energy generation. Community Power provides vital information so that we can move the state forward to grow this emerging sector so that California can meet its goals of reducing pollution to protect the environment and public health. Nature does a great job of distributing energy to every community. Community Power shows us the way to make sure we’re doing a better job of using it and weaning ourselves off of limited, polluting fossil fuels. Energy, like land, water, and clean air, is a resource that is essential to healthy communities. Community Power shows us that local decentralized energy can enable not only environmentally healthy communities, but also economically healthy and socially equitable communities. We must reclaim the power of the sun. The only way we are going to effectively and rapidly make the transition away from fossil fuels is to place that transformation in the hands of citizens and communities. Community Power is California's guide to descaling the solution so that people everywhere can participate in leading the nation to a secure and stable energy future. Al Weinrub's Community Power addresses many benefits of decentralized renewable power, including the increased energy security that comes from widespread distributed generation of electricity. These relatively small projects can be built quickly to improve system reliability and reduce the energy supply vulnerabilities associated with centralized power systems. Preserving deserts is as important to mitigating climate change impacts as preserving rainforests. COMMUNITY POWER provides great alternatives to scraping up living desert ecosystems, and shows how renewable energy does not have to compete with habitat for desert species and carbon-storing vegetation. Laura Cunningham, Solar Done Right; Co-founder of Basin and Range Watch. Community Power helps overturn the conventional wisdom that bigger is better, illustrating how decentralized, distributed renewable energy can provide a cost-effective and economy-boosting strategy for meeting our power needs. Decentralized community-oriented power is simply elegant common sense. Any thoughtful person wants to ensure that the way we power our societies works for all people and all creatures. Al Weinrub’s Community Power gives us a handbook to power California consistent with in the great web of life. Wholesale Distributed Generation is the single most important market segment for achieving significant deployments of cost-effective renewable energy in the coming decade. The many reasons span economic, environmental, and national security considerations; and Community Power does a tremendous job of highlighting the details.